for him easy to read screen, decent camera, good ear-piece sound quality are most vital plus value for money. i rate this phone 5/5 because it's user friendliness. Seems that samsung still need to work more for their duos mob. (champ, Y, Ace duos, etc) as many errors in messaging sys (SMS). Why GsmArena says that the device has 512mb ram and i see that it has only 271mb of ram ?!!!!! Is this Marketing for Samsung or what ???? I bought Samsung S6802 but when it is off and i connect the charger inside to taking charge it turn on the phone plz help me what is the problem? but many smartphones are better than Live With Walkman, just say it, Arc S, ray, pro, Xperia S, Xperia P, Xperia Acro S, even Lumia 900 is better than Live with Walkman..
Mobi, 08 Aug 2012Kinoti, Dude you don't know updated knowledge....with latest firmware update you can have &... morehii.. im usng galxy ace duos sims of difnrt netwrks.. whn im enablng dis smrt dual sim optn , im receivng an error msg sayng da fnctn is disabld.. hw can i activat dis ? plz hlp me... thnx..
[deleted post]dude, you need to stop talking about live with walkman all the time. 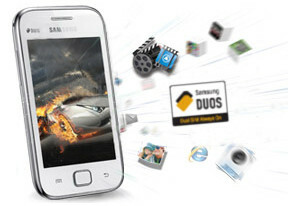 people are looking for dual sim functions in galaxy ace duos. hey guys, i brought this phone yesterday. The phone is quite good but when i press the power button it takes almost 2 seconds to show the display..
plzz tell me if anyone else facing the same problem.